Gluten free bread recipe may be a solution to abdominal pain. 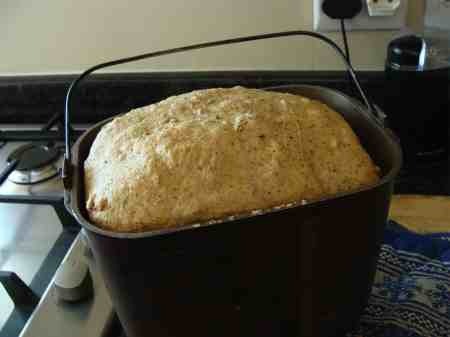 Gluten free bread recipe may be a solution to stomach pain and indigestion. The whole subject of the big G allergy, intolerance and bowel disease is very complex. It's also quite controversial; folk simply aren't enjoying the modern loaf any longer for one reason or another. It's the protein found in wheat, rye and barley that is the problem. Proline isn't easily digested. In severe cases, fortunately relatively uncommon, a gluten allergy leads to a very serious illness called Celiac disease that causes chronic small bowel inflammation, leading to a variety of malabsorption syndromes. There's only one way; sufferers must absolutely avoid gluten for the rest of their lives; it's tough. But the alternative is severe abdominal pain, and sudden bouts of embarrassing diarrhoea with no warning; foul smelling stools that float and may contain blood are the hallmark. It all leads ultimately to a bowel resection and a colostomy if the inflammation continues. For the rest, a gluten intolerance causes a variety of bowel symptoms; diarrhoea, bloating, heartburn and pain. The controversial part is that a gluten intolerance is often blamed for a whole long list of symptoms such as fatigue, headache and depression; see the many webpages on the subject. Certainly in some cases, and perhaps more than we realise, these symptoms have nothing to do with a gluten allergy. You may find your medical doctor skeptical and reluctant to send you for expensive blood tests. 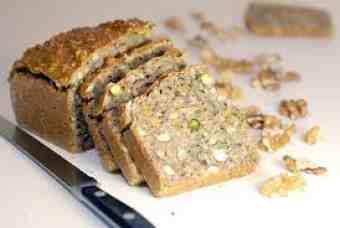 Is a gluten free bread recipe perhaps part of the solution to your pain in the tum? There is increasing evidence that the health of the microbiota in your colon have much to do with inflammation in the gut and in fact the whole of the body. All our refined carbs and easy starches do not reach the colon but are quickly digested in the small intestine, producing a surge in blood sugar; not healthy at all, and the healthy bugs further down the alimentary canal are starved of nutrients; they turn your carbs not into glucose, but compounds like butyrate which is a powerful anti inflammatory compound. We enjoy these kefir benefits daily; they have made a profound difference to the health of my abdomen. No matter how many tablets of probiotics you take, if they are not getting the prebiotic food they will starve. One simple technique to make sure your potatoes get to the colon is to cool them once cooked overnight in the refrigerator, and reheat them the next day. Read more at reheating resistant starch; this is vitally important stuff for those suffering from bowel disease. It's interesting that the amount of bread consumed in Western societies is dropping, some would say alarmingly. Whole wheat is a vital source of many vitamins and fatty acids, and fibre too; the lignans are of the most important bastions in the prevention of breast cancer. Does today's bread give you heartburn and bloating? Diarrhea and indigestion? Do you find it unsatisfying and unfulfilling? It may have nothing to do with gluten allergy. You're certainly not alone. Today's supermarket bread is, by and large, junk food, full of chemicals, and not baked with yeast at all. Or with large quantities of yeast to speed up the process. And of course, white flour has none of the nutrients that make good bread a wholesome food; like sugar it's just empty calories. To get full value out of bread, the taste to die for, one needs to slow down the process allowing certain friendly bacteria to do their work, says Whitley, not speed it up. It's an expensive book, I think worth it, and less than half on Kindle; certainly a keeper for those serious about bread matters. I love my copy and it's given me a new understanding of a gluten free bread recipe. One of the chemicals added to the modern loaf, transglutaminase, has now been conclusively shown to be the reason why today's bread has made the protein in bread toxic for so many of us. It actually causes gluten intolerance and may well be one of the causes of Celiac disease. Generally it's believed there is no known cause of Celiac, also spelt Coeliac disease; but a gluten free bread recipe was previously, before grasping the significance of sourdough, the only known treatment. Do you suffer from chronic diarrhoea? Try cutting out ALL the wheat in your diet for a month. Confusingly, a gluten intolerance causes constipation in some. Bread Matters has a large section specifically for the person who is gluten intolerant. I have found bread making a source of simple wonder and deep satisfaction. Thank you for bring us back to the daily loaf. My two young sons choose baking over playing computer games any day. I have run the gamut of emotions in my kitchen, but one of the greatest pleasures I have ever found there is tasting my first loaf under the guidance you give in Bread Matters. This is a scholarly, but highly readable book. Whitley is himself a master baker, but obviously has a astute and highly educated mind too. It's a profound book, full of recipes; I have enjoyed it immensely. More important I have found homemade bread does not have to give me indigestion like the supermarket loaf. Bread making links me to profound feelings about life and what makes the daily loaf good and meaningful. Kneading bread and chiropractic go hand in hand. We now bake our own loaf virtually every day. You could too. For Christians, there are perhaps few more profound passages than the words of Jesus; "I am the bread of life; he who comes to me shall never hunger." But when bread loses its wholeness, it no longer satisfies our hunger pangs, in fact it starts feeling like an indigestible lump in the pit of the stomach; not unlike some religion, eh? If you would like to know more about the science of bread making, and a host of excellent bread recipes, then buy this masterly book. It'll tell you all about the gluten free bread recipe. Dissolve the yeast in the warm water and mix with all the other ingredients except the flax seeds. The dough should be like a smooth, wet cement. You should be able to pour it. Grease a small bread pan. Scrape in the dough. It should come no more than half way up the sides. Cover and proof in a warm place. When it has risen about 50 percent increase in volume, sprinkle the flax seed on top of the dough. Or brush with olive oil. Bake in a hot 415F, oven for about 30 minutes.The loaf is done when it begins to shrink away from the sides of the pan. I confess I have not yet made this gluten free loaf, not being intolerant but, if it's as good as all his other recipes you can bank on it. I'm going to try and get these ingredients and see if it works in our bread machine. Having said that, most of my indigestion, bloating and pain from the commercial bread has virtually stopped since making our own low GI bread without all the chemicals in the industrial loaf. I'm convinced Whitley is right about the transglutaminase and other artificial stuff in bread. I have found making this easy zucchini bread recipe has a soothing affect on the bowel too; it's one of my favourite healthy vegetables, and so easy to grow. Interesting research published in the journal Applied and Environmental Microbiology reveals that an alternative to gluten free bread, and perhaps even for those suffering from celiac disease, is sourdough bread. The lactobacillus in the starter is able to digest the problem child, the amino acid proline. I too get indigestion from supermarket bread, and find that my own tum is far more comfortable with this sourdough bread recipe. It takes only five minutes if you have a bread maker. Whilst I don't get diarrhoea or cramps, gluten free bread recipe using sourdough has been a big step forwards for my own tum. You too should perhaps know more about the meaning of gluten. Flaxseeds are the best vegetarian source of omega-3; but I would recommend grinding them before adding them to your gluten free bread recipe as recommended by Whitley; whole seeds pass through the gut undigested. And in fact may irritate the bowel. Of great concern is that that food manufacturers may label the products "wholemeal flour" if it contains at least 51% of the whole grain. However, the 49% that is removed contains the bulk of the fat, vitamins, minerals and bran. 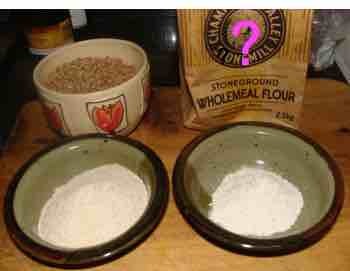 Always look for "100% wholemeal flour" and if you're serious about your food, think of buying your own wheat grinder. Does wholewheat flour go bad? Yes, it certainly does. The fatty fraction goes rancid once the grain is crushed and exposed to air. This whole wheat vs whole grain flour page at chiropractic help gives you another perspective on this important subject; it's highly controversial and has to do with the deceit of food manufacturers.